Revivez l'époque des empereurs des Habsbourg et découvrez à quoi ressemblait Vienne lors d'un bombardement de la Seconde Guerre mondiale. J'ai vraiment aimé cette expérience ! Tout est parfait du début à la fin. Un seul reproche: ça passe beaucoup trop vite!!! Je serais restée là encore plus longtemps tellement c'était bien fait ! Bravo et merci! concept intéressant et original, alliant une visite à pied à travers les caves et 3 manèges avec des sensations très sympas. à faire absolument si vous avez des enfants, quelque soit leur âge. Maniere tres originale pour decouvrir l'histoire de la ville. A faire au debut du séjour. This was a first time doing one of these time travel experiences. Was good and very informative. BEST EXPERIENCE EVER!!! WOULD 100 recommend!!! This was an experience you won't forget into the history of Vienna. Well worth the euros. I would do this tour before taking the Hop and Go Bus. It was entertaining, some parts were so real including the underground air raid shelter. You could feel snow on your face too! and they warn you about the rats!! The tour guide headphones in English was extremely helpful, the 5D films were not for people with motion issues but were very surreal. If you have mobility issues this tour is not for you as there is plenty of standing. I don't recall there being an elevator set up. This was 50 minutes well spent. Taking you back through time and experience the history of Vienna. 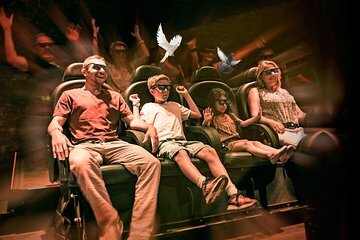 A 5D experience starts it all off where you fly high across Vienna and also along the streets experiencing the time machine. The time of dance has upu swirling and turning on there waltzer and finally a reality horse and coach ride. Much better tour for very young ones.